The Run Down: What this means is that all catalytic converters used for vehicles that are California OBD 1 (vehicles mostly made before 1996) and OBD 2 will have to use catalytic converters that have a stamp, on the converter, from the ARB(Air Resources Board) to pass smog in California. The smog stations are already set-up to run the number on the catalytic converter through their computers when you come in. If you have a number that is not specific to your vehicle, you will not pass smog. If you have any questions you can contact us for the listing of your vehicle. We are in complete compliance for the state of California and have the correct converter for your vehicle to pass smog. Bob's Muffler is not a certified smog station, but we are authorized to install any and all legal catalytic converters on vehicles. VEHICLE APPLICATION CATALOG INSTRUCTIONS - Application look-up will no longer be based upon G.V.W. (Gross Vehicle Weight) and engine size. Application look-up is the only approved method for determining the correct part number. 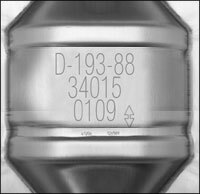 It is illegal to select a catalytic converter for installation based solely on vehicle weight, engine size, physical shape, size, configuration or pipe diameter. (PC-1): Passenger car single configuration. (PC-2): Passenger car dual configuration.